Lamp power: 50W. at our warehouse. Zoom factor: fixed focus. Zoom ratio: 1.3: 1. Lamp life: 30,000 hours. Optoma HD27HDR. Its HDMI 2.0 with HDCP 2.2 input and 50,000:1 contrast ratio accept HDR10 content for brighter whites and deeper black levels with vivid colors and an unmatched 1080p viewing experience. Model: CL720D. This projector is integrated with high performance projection engine function, and simple. - Do not place the projector in the wet condition, avoid to getting an electric shock. - Long LED lamp life up to 50,000 hours. Model: CL720D. This projector is integrated with high performance projection engine function, and simple. Native Resolution: 1280 x 800. â Do not place the projector in the wet condition, avoid to getting an electric shock. Excelvan CL720D LED Projector 3000LM 1280 x 800 Native Resolution with Digital TV Interface Support HDMI USB VGA AV Input. Model CL720D. Native Resolution 1280 x 800. Main Features: ● Withdigital TV interface input. Resolution: 1280 800 physical resolution Support 1080P. Battery 2000mAH. Input port: Micro SD, HDMI, AV, Micro USB, USB2.0. Projection Technology: LCD. Projection Distance: 1.45-5m. Projective Mode: Back Projection,Throwing,Ceiling. Type: Overhead Projector. Light Source: Led Light. LED Light QTY: 70. Zoom: x 1.4. Operation Language: 23(Japanese Included). Support 1080P And 4K Video Display. In addition, it supports Full HD 1080P (1920 1080) and 4K video playing. With HDMI / USB / AV / Headphone / VGA / TF Card Interfaces. Built-in New Version Android 6.0.1 OS. CPUMStar6A638 Decode 4K H.265/VP9 4K 2K/60HZ. Display Type DLP. 3D Support DLP-LINK active shutter 3D. Sound effects Support Dolby sound effect. Keystone Correction Supports automatic and manual. Total Power Consumption <35W. 1x AV Cable. 1x LED Projector. Note:3D:Red and Blue 3D Video,Need to bring your own red and blue 3D glasses. 2x 3D Glasses. 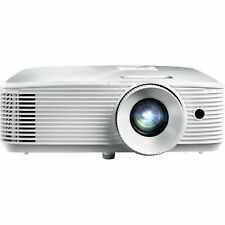 Projector Distance:0.8-5m. 3D Function:Red Blue. Display Technology:LCD display. This projector features a 1080p full HD optimized optical system for unmatched picture clarity and detail along with lens shift, short-throw technology, big zoom. 5.8” TFT LCD. Built-in speakers no need to connect extra sound. Its powerful laser phosphor light engine, High Dynamic Range in the form of HDR10, vertical lens shift and massive 1.6x Zoom, take image quality and use of the UHZ65 to world class, cinema-quality. The UHZ65’s light source provides a remarkable 20,000 hours, eliminating the need to replace the light source throughout the life of the projector. MFG Part #: MH530FHD. Crisp Full HD 1080p for Expanded Viewing. The high luminance boosts picture quality with vibrant color for pictures and videos as well as crisp text and fine details. Keystone correction makes it easy to project ideally aligned images from a variety of locations. · ANDROID 6.0，WIFI, Bluetooth. 1 x Projector. 1 x AV transfer cable (100cm). · Supports picture, vedio, audio format. 1 x User's manual. HOT 36 LED Solar Power Motion Sensor Garden Security Waterproof Outdoor Lamp CA. · ANDROID 6.0，WIFI, Bluetooth. 1 x Projector. 1 x AV transfer cable (100cm). · Supports picture, vedio, audio format. 1 x User's manual. · Features image flip function, supports horizontal and vertical flip. P/N: MH530FHD. Manufacturer: BenQ Corporation. Output Scan Format: 1080p. Projection Lens. We may no longer be able to change or cancel your order. Maximum Diagonal Image Size: 25 ft. Native Aspect Ratio: 16:9. Display Type DLP. Focus mode: Electric motor focusing by remote. Headphone Output Audio output, 3.5mm connectors (can connect headphones or speakers). Total Power Consumption <35W. USBUSB HOST 2.0 1 USB HOST 3.0 1. (1) Protect your eyes from TV & Cellphone, Save your penny from Cinema. ☆No.2 Built-in Android 4.4 Wifi & Speakers, Bluetooth supported - The projector itself supports Built-in Android 4.4 Wifi System, Bluetooth and Speakers. From Hong KongResolution: 720pConnectivity: WiredController: Smartphone/Tablet Control App. This projector features a 1080p full HD optimized optical system for unmatched picture clarity and detail along with lens shift, short-throw technology, big zoom. watch TV by HDMI connecting the TV BOX. This projector is integrated with high performance projection engine function, and simple. - Do not place the projector in the wet condition, avoid to getting an electric shock. Function Speaker,3D,External Subtitle. The 3LCD design enhances color brightness while reducing the rainbow effect. Supports Multiple 3D Formats. Full HD (1920 x 1080) Native Resolution. It provides VGA and two HDMI inputs to connect both standard definition and HD sources, plus one HDMI input is MHL-compatible for connecting devices such as smartphones and tablets. Brightness: 3500. at our warehouse. Resolution: 1280 720. Screen ratio: 16:9. AV & Headphone. Equipped with HDMI, USB, UGA, AV, TF and Earphone jack. LED-4018 is a small and compact projector with a portable size of 20.7cm 15cm 8.5cm and a light weight of only 892g. Support Max TF Card. Model Number: AKEY2. Video Decoding: Support 4K,2K,AVC/H.264,MPEG-2,MPEG-4(Visual XviD),HEVC,H.263,WMV2,WMV. Keystone Correction: Manual Correction. Keystone Correction: ±15° (vertical). Wireless: WIFI, Bluetooth. Its HDMI 2.0 with HDCP 2.2 input and 50,000:1 contrast ratio accepts HDR10 content for brighter whites and deeper black levels with vivid colors for an unmatched 1080p experience. An enhanced gaming mode compatible with 1080p HDR sources reduces input lag to 16ms for lightning-fast response when connected to the latest HDR ready gaming consoles and PCs. Item model number: MH530FHD. Projection System: DLP. Native Resolution: 1080p (1920 x 1080). Projection Offset: Vertical: 107%±2.5% (Full image height). Side by Side: Up to 24Hz 1080p. Lens: F=2.42-2.62, f=19.0-22.65. E09 installed Android 6.0.1 operation system with Quad-core A53 1.5GHz CPU. You can surf the internet just by connect E09 with wifi. E09 could also connect with many devices by cables for your different needs. CPUMStar6A638 Decode 4K H.265/VP9 4K 2K/60HZ. Display Type DLP. 3D Support DLP-LINK active shutter 3D. Total Power Consumption <35W. HDMISupports HDMI 2.0input. TF CardMaximum supported 32G. USBUSB HOST 2.0 1 USB HOST 3.0 1. Display Type DLP. Focus mode: Electric motor focusing by remote. Total Power Consumption <35W. HDMISupports HDMI 2.0input. TF CardMaximum supported 32G. USBUSB HOST 2.0 1 USB HOST 3.0 1. OUTPUT INTERFACE.